After spending hours (or even days) prepping your sermon, you want your message to be clearly understood and deliver its full impact. The congregation’s ability to understand what’s being said — intelligibility — is the primary goal of most church sound systems. Poor speech intelligibility can have major consequences. Even if the sound system is loud enough to be heard throughout the sanctuary, the congregation will find it difficult to focus if the pastor’s words can’t be clearly understood. Some studies have even suggested that poor speech intelligibility might be a contributing factor to declining attendance. If you’ve ever been to a service where you can’t understand the presenter, you know how frustrating and unengaging that experience can be. Unfortunately, when there are intelligibility problems, the person who hears about it is the sound technician, who likely has little control over the underlying issue. Speech intelligibility is best addressed at the source, and can’t always be corrected at the mixing console, even by the most talented audio engineer. For most churches, the easiest way to improve speech intelligibility is microphone choice and placement. 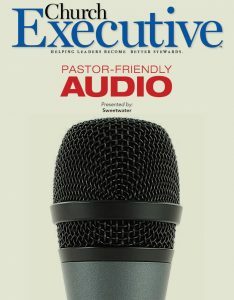 Selecting the right microphone and placing it in close proximity to the pastor’s mouth are the first steps to clear speech, while avoiding distracting feedback. The fundamental principle about microphone placement for speech is “the closer, the better.” When the microphone is nearer to the presenter’s mouth, it will pick up more direct sound and less reflected sound. The sound bouncing off of other surfaces — such as walls or the ceiling — just tends to blur what is picked up by the microphone. A mic that is placed directly in front of the mouth will pick up clearer diction and better consonants versus one placed under the chin or clipped onto clothing and aimed at the ceiling. It will also pick up less of the amplified sound coming through the sound system, and therefore is less likely to cause feedback. In most cases, headworn mics are the best option. The microphone position is optimal because it is so close to the mouth — and just as important, the mic moves with the presenter’s head. Having the mic stay in the same position as the pastor turns his or her head, means that the sound level and presence stays the same. A high-quality, flesh-tone, headworn microphone is often so small that it’s virtually invisible from more than a few yards away. In most cases, the congregation (and video cameras) can’t see the pastor is wearing a mic at all. Headworn microphones are typically less problematic for volunteer audio technicians, because of their optimal placement. Feedback is minimized, and the sound tech doesn’t need to know how to drastically adjust the EQ to fix feedback or other problems. Some pastors prefer to use a handheld microphone when preaching. 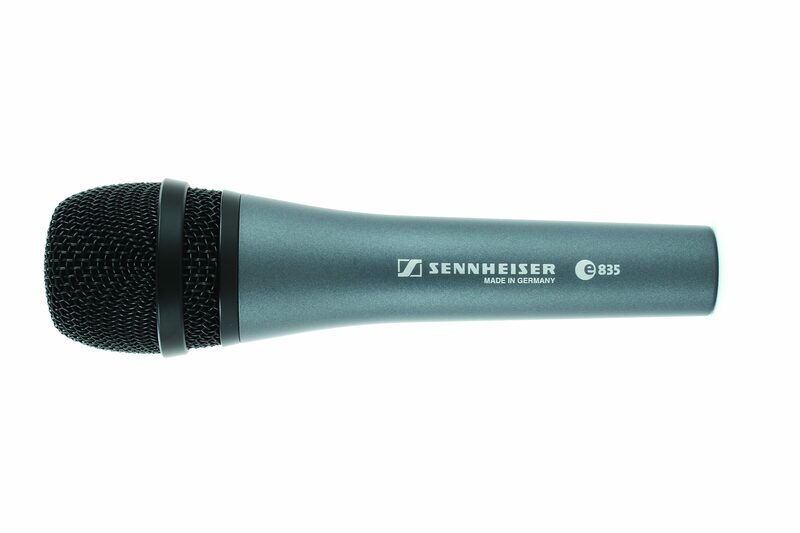 Handheld microphones are available in both wired and wireless options, and can be less expensive than their headworn counterparts. When used properly, handheld mics can be a great choice. The trouble comes when presenters (either pros or amateurs) use poor microphone technique. The best place to hold a handheld mic is directly in front of your mouth, aimed directly towards your lips, at a distance of about 3 inches. Keep in mind that handheld mics should be used speaking directly into the front of the mic, not talking “across” the top of the mic. Care must be taken to ensure that the 3-inch distance remains constant; otherwise, dramatic changes in volume and the tone can result. One drawback of using a handheld microphone is that you lose the ability to use both hands when presenting. If one hand is occupied with a mic, it makes turning pages trickier. But, a handheld mic is definitely easier to share (question-and-answer-style) if you are doing an interview onstage. A stationary pulpit or podium-mounted microphone is probably the easiest way to mic a presenter, but it has several limitations. First, although great placement is possible (directly in front of the mouth, and a few inches away) , it’s almost never practical. Most podium mics tend to end up too far away from the pastor’s mouth, increasing both the amount of reflected sound they pick up and making feedback much more likely. Although it might seem obvious, a stationary microphone’s biggest drawback is the fact that it’s stationary — it doesn’t move with you. Not only are you not free to roam around the platform, if you lean in or out or move from side to side while speaking, the volume and tone of your voice will vary quite dramatically as your distance from the mic changes. This requires the sound operator to be on his or her toes, “chasing the sound,” making constant adjustments to keep the sound consistent while avoiding feedback. Despite these drawbacks, stationary microphones are still a great option for others who speak infrequently, and therefore might not need their own wireless microphone. 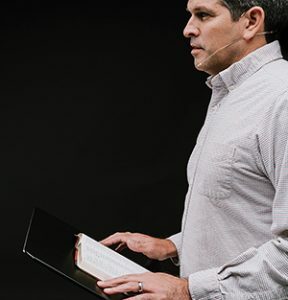 If you use a stationary mic for moments such as announcements or scripture reading, it’s important to teach those who will be using the mic how to adjust it for the best placement before they start speaking. The most problematic type of microphone for intelligibility is, unfortunately, one of the most commonly used by pastors: the lavalier (“lav,” for short) or lapel mic. 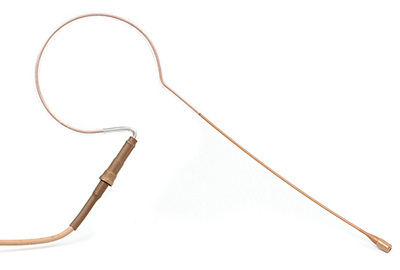 Lavalier mics are typically worn on a necktie or lapel. Although they are used primarily for live speech reinforcement today, they were originally designed for a very different purpose — television news broadcasts. They are still ideal for that type of application — there are no loudspeakers on set, so no worries about feedback. News broadcasts are typically shot in a quiet, acoustically treated studio, where noise and reflected sound are minimized, and the anchors sit still behind a desk. In church sound, however, lavaliers are fraught with problems. Placement is far from ideal, usually on the chest 6 inches or more away from the speaker’s mouth, and aimed towards his or her chin, not their lips. This means pickup of consonants is typically very poor, and the mic picks up a lot of unwanted sounds (reflections, rustling clothing noises, etc.) as the pastor speaks. Frequently, these are made to pick up sounds from every direction to make them easier to position; but, that means they pick up just as much sound coming from the side away from the speaker’s mouth, which makes them more prone to feedback. Additionally, placement is not consistent. As the wearer moves around, the mic’s position in relationship to the mouth is constantly changing, resulting in changes to the volume and tone of the pastor’s voice. A sound technician needs to be well-trained in order to deal with these challenges, and even the best audio engineers still struggle with lav mics in many applications. Not sure if your system suffers from poor intelligibility? Here’s a simple test you can use to determine how well your congregation can understand the words spoken through the sound system. Ask some volunteers (the more the merrier) to sit in scattered locations around the sanctuary. Be sure to have at least a couple in the back, where intelligibility is typically the poorest. Also, you’ll want your volunteers’ ages to be representative of your congregation. The Federal Communications Commission (FCC) has auctioned off a large amount of radio frequency bandwidth to wireless telecommunication companies, effectively making it illegal to use thousands of wireless microphones and in-ear monitor systems that operate within that band. Have another volunteer (not the pastor or another person they are accustomed to hearing) read a list of 50 words at 10-second intervals. For a good list of words, do a web search for “50-word intelligibility test.” The person speaking should be using the same microphone the pastor uses, standing in the same place, and in a conversational tone of voice, not shouting or over-articulating the words. Have the volunteers write down the words they hear. How did they do? If your church is like most, you might be surprised at how many words your volunteers mishear, even with the help of a sound reinforcement system. What’s a “passing” score? That depends — how much of your message do you want the congregation to hear and understand? Most sound system designers would consider any score below 90% to be unacceptable. There are many factors that contribute to the intelligibility of a sound system, as well as its propensity for feedback: natural room acoustics, background noise, speaker mounting location, and system specifications, to name a few. Our team can help you determine which factors are affecting the intelligibility of your sound system, and what you can do to improve it — including which microphone(s) will work best for your speaking style. Call (800) 222-4700 to get started! Jeff Barnett is the Director of House of Worship Sales at Sweetwater. Barnett is also an instructor in Sweetwater’s Academy of Music and Technology, teaching live sound techniques. His background includes live sound engineering, recording engineering, system design, and installation. He is also a performing musician, singing in a vocal jazz group. Over the course of his career, Barnett has helped equip thousands of churches and musicians for their ministry.